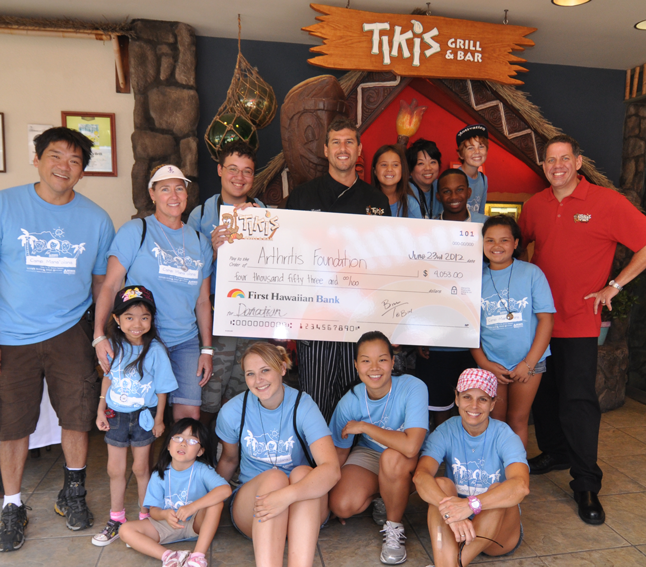 Tiki’s loves the Arthritis Foundation of Hawaii! This is our third year for team Tiki’s to participate in the annual Arthritis Walk! Tiki’s own Michael Miller has been on the board of the local chapter of the Arthritis Foundation and this year, to show our support, Tiki’s donated 50% of our sales of two popular items for one month. Sales from the Hawaiian Hurricane Drink and our very popular Kalbi Beef Gyoza exceeded $8000 from April 20th through May 20th. Tiki’s was able to donate $4053!